Trimethoprim is an antibiotic used to treat bacterial infections. It works by stopping the growth of bacteria. Take this medication by mouth on an empty stomach at least 1 hour before or 2 hours after a meal as directed by your doctor. It may be taken with food if stomach upset occurs. Dosage is based on your medical condition and response to therapy. Continue to take this medication until the full prescribed amount is finished, even if symptoms disappear after a few days. Stopping the medication too early may allow bacteria to continue to grow, which may result in a relapse of the infection. Inform your doctor if your condition persists or worsens after several days. What conditions does Trimethoprim treat? Diarrhea, nausea, vomiting, stomach upset, loss of appetite, changes in taste, and headache may occur. If any of these effects persist or worsen, notify your doctor or pharmacist promptly. Tell your doctor right away if you have any serious side effects, including: signs of infection (such as fever, persistent sore throat), easy bruising/bleeding, unusual paleness, mental/mood changes, tiredness with fast/pounding/irregular heartbeat, dark urine, persistent nausea/vomiting, stomach/abdominal pain, yellowing eyes/skin, stiff neck, persistent headache, muscle weakness, extreme drowsiness, signs of low blood sugar (such as sudden sweating, shaking, fast heartbeat, hunger, blurred vision, dizziness, or tingling hands/feet). List Trimethoprim side effects by likelihood and severity. Before taking trimethoprim, tell your doctor or pharmacist if you are allergic to it; or if you have any other allergies. This product may contain inactive ingredients, which can cause allergic reactions or other problems. Talk to your pharmacist for more details. Before using this medication, tell your doctor or pharmacist your medical history, especially of: a certain type of anemia (due to folate deficiency), kidney disease, liver disease, vitamin deficiency (folate or folic acid), blood disorders (such as bone marrow suppression, G6PD deficiency), mineral imbalances (such as high level of potassium or low level of sodium in the blood). Trimethoprim may cause live bacterial vaccines (such as typhoid vaccine) to not work as well. Do not have any immunizations/vaccinations while using this medication unless your doctor tells you to. Older adults may be more sensitive to the side effects of this drug, especially mineral imbalance (high potassium blood level) and allergic reactions. This medication is not recommended for use during pregnancy. It may harm an unborn baby. Consult your doctor for more details. This medication may lower your folic acid levels, increasing the risk of spinal cord defects. Therefore, check with your doctor to make sure you are taking enough folic acid. Trimethoprim passes into breast milk. While there have been no reports of harm to nursing infants, consult your doctor before breast-feeding. What should I know regarding pregnancy, nursing and administering Trimethoprim to children or the elderly? This drug should not be used with the following medication because a very serious interaction may occur: dofetilide. If you are currently using this medication listed above, tell your doctor or pharmacist before starting trimethoprim. Before using this medication, tell your doctor or pharmacist of all prescription and nonprescription/herbal products you may use, especially of: digoxin, methotrexate. This medication may interfere with certain laboratory tests (including kidney function and methotrexate blood levels), possibly causing false test results. Make sure laboratory personnel and all your doctors know you use this drug. Does Trimethoprim interact with other medications? If someone has overdosed and has serious symptoms such as passing out or trouble breathing, call 911. Otherwise, call a poison control center right away. US residents can call their local poison control center at 1-800-222-1222. Canada residents can call a provincial poison control center. Symptoms of overdose may include nausea, vomiting, headache, dizziness, mental/mood changes, confusion. Laboratory and/or medical tests (e.g., complete blood counts, kidney function, potassium blood level, cultures) should be performed periodically to monitor your progress or check for side effects. Consult your doctor for more details. Store at room temperature between 59-77 degrees F (15-25 degrees C) away from moisture and light. Do not store in the bathroom. Keep all medicines away from children and pets. 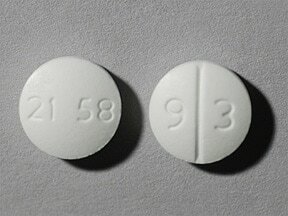 This medicine is a white, round, scored, tablet imprinted with "9 3" and "21 58". 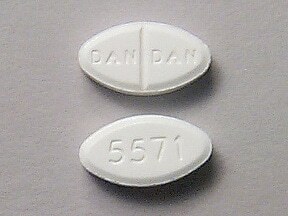 This medicine is a white, oval, scored, tablet imprinted with "DAN DAN" and "5571". 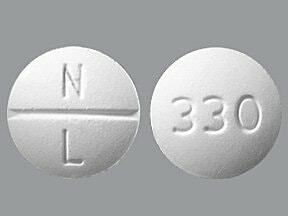 This medicine is a white, round, scored, tablet imprinted with "N L" and "330". Are you considering switching to Trimethoprim? How long have you been taking Trimethoprim?